I was lucky enough while out in the Masai Mara to witness a leopard hunt in the region of Intrepids Camp. We arrived as the female leopard (who I have been since told is called Bahati - meaning Fortune - and daughter of Olive, granddaughter of Bella from Big Cat Diary) had come down from a tree and then emerged from bushes by the track. As you can see from the video, she rolled in the dust and then appeared to spot gazelle nearby. Instantly her posture changed, she slunk down onto her haunches and crept into the long grass. It was amazing to see how low she could stay, and the stealth with which she moved. As she approached the oblivious gazelle, we watched on from the jeep, and despite standing and looking down at the scene, eventually we lost sight of her too in the grass. Such incredible camouflage when seen in their natural environment! We waited patiently, holding our breaths, and with my camera trained on the gazelle. Minutes passed but we were all intently waiting and watching. 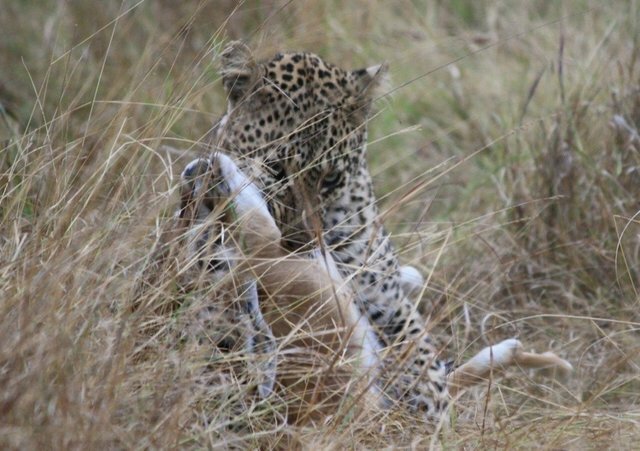 Suddenly, as you see in the video, she exploded out of the grass and around the closest gazelle, who didn't stand a chance, gripping it by the windpipe. Such speed and power was phenomenal to watch - you can see how I jumped on the video! After it's prey was subdued, Bahati paused to give us a few more photo opportunities and then dragged the gazelle off back to through the bushes. It made me realise how small a leopard is compared to some of the larger cats, as it seemed quite unwieldy for it. We watched it toy with its food in the bushes for a few minutes, and then it disappeared into thick bush (presumably back up a tree again - though sadly I didn't get to witness that). The whole event lasted about 15 or 20 minutes I should think, and I barely breathed through all of it. It felt a real privilege to be there to witness such a moment..
Hopefully you can enjoy the video and get a taste of the moment for yourself.